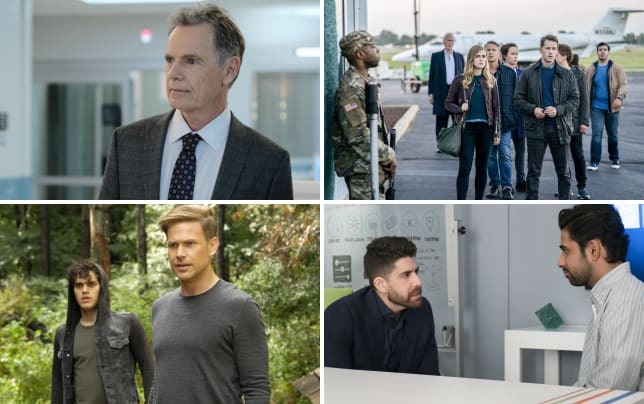 Sometimes, a season finale is so well done, it could hand itself to a series finale. 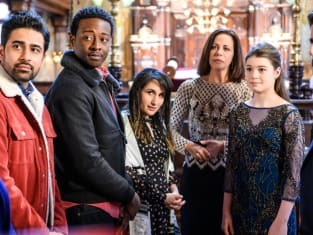 If I didn't know the series was renewed for a second season, I would have thought God Friended Me Season 1 Episode 20 was closing the book for us. Or at least, closing the chapter of the God Account. Though Miles, Cara and Rakesh always run into some troubles, everything always has a way of working itself out. 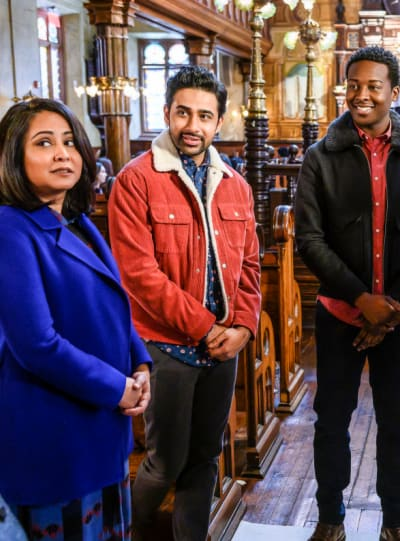 By the end of the hour, it truly felt like Miles' work with the God Account was done and Cara and Rakesh were starting their own journey independent of Miles. But then... the God Account flipped the script by bringing in another character into the fold, a woman named Joy, who was friended by the God Account and sent Miles as a Friend Suggestion. 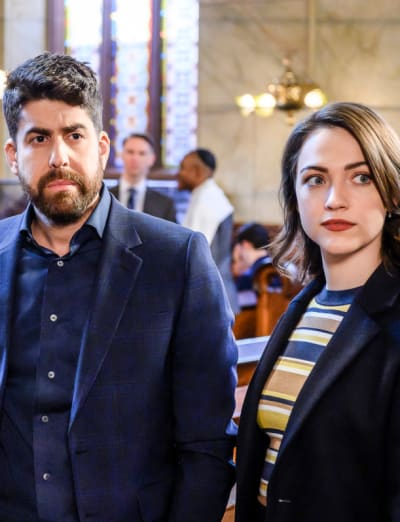 I spoke with show creators Bryan Wynbrandt and Steven Lilien below who said that God Friended Me Season 2 will explore why Miles became a friend suggestion -- is it because he knows how the account operates or is it because he needs help this time around? 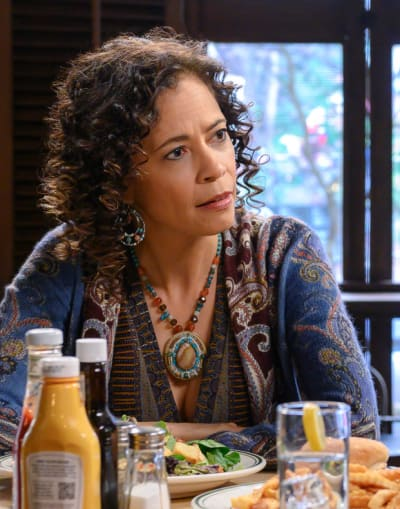 The finale also revealed that Henry Chase is not behind the God Account as previously believed. 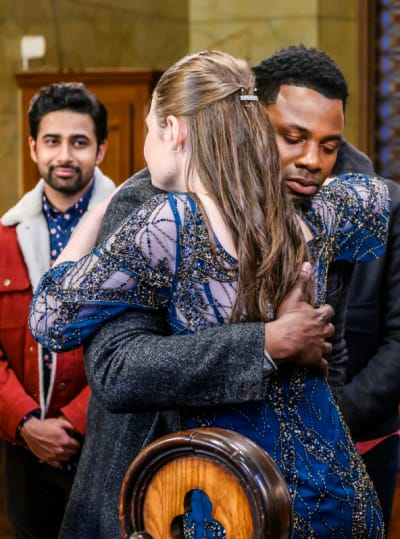 After searching for Chase throughout most of the season, Miles, Cara and Rakesh were finally able to track him down thanks to Graham Hastings, a previous friend suggestion who played chess with Falken aka Henry. Tracking Henry down was nearly impossible for much of the season, so why was it so easy in the end? Why didn't they think of this sooner?! While we initially believed Henry was the creator of the God Account, upon meeting him, we realized he needed Miles' help just as much as the previous Friend Suggestions. Henry lacked purpose, clung onto the mistakes and pain of his past, and didn't have much fate. He reminded me a lot of Miles in the beginning of the series before he being introduced to, and believing in, the God Account. When Henry tried to push away Simon and Pria despite Simon telling him he wanted to use the Juliette code for good and Priya announcing that her cancer was in remission, the God Account suggested they all head over to a bat mitzvah for Erica Katz, a girl they've never met. Of course, it seemed like an odd suggestion, but we know the God Account never does anything without a purpose. When it was revealed that the Erica almost drowned at the Hudson Bay six months prior and miraculousy survived because of Simon Hayes' mystery project, it changed things for Henry. It reignited his belief in himself, in his friends, and the idea that he could help others despite not being able to save his sister. With his faith restored, Henry, Pria and Simon decided to continue their work and change the world like they've always wanted to. Miles has helped plenty of Friend Suggestions, but this one felt like the end all be all. And again, everything happens for a reason. Bringing Henry into the fold and reuniting the team gave Rakesh a new job as head of R&D at Singular Dynamics while Cara was offered a gig documentaing their work in Paris for a book. I know what you're thinking ... Paris is really far away and Miles and Cara just figured out their relationship. But who else can make it work if not these two? 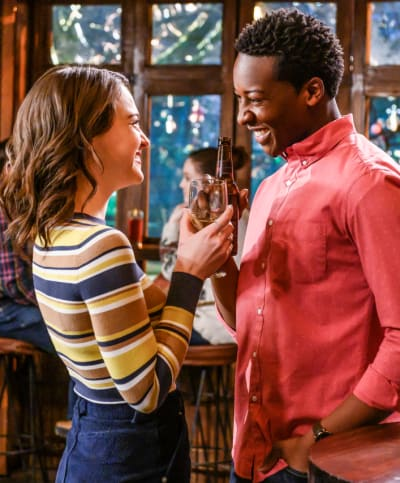 We've spent a whole season watching Cara and Miles be virtually inseperable, but it's time they followed their own dreams. Putting a little distance between them might be for the best. And your heart had to skip a beat after Miles encouraged Cara to pursue her career. It wouldn't be true love if he asked her to sacrifice something this major for him. It's a testatement to how selfless he is and how much he's grown since they first met. Arthur wasn't elected Bishop of New York, and though it was a devastating loss, he was also forced to step out of his comfort zone. Bishop would have been the natural next step for him; it's what Arthur has been preparing for his whole life. But now, the rug was pulled out from under him and he's forced to forge a new path and find a new meaning of life. A wedding to Trish, a woman who already vowed to stay by his side, seems like the perfect first step. But will he miss the church and helping people? Will he find a new way to help his parishoners? Maybe by becoming more involved through the God Account. He already embraced it by becoming a guest on the podcast, something we never thought was possible in the beginning. 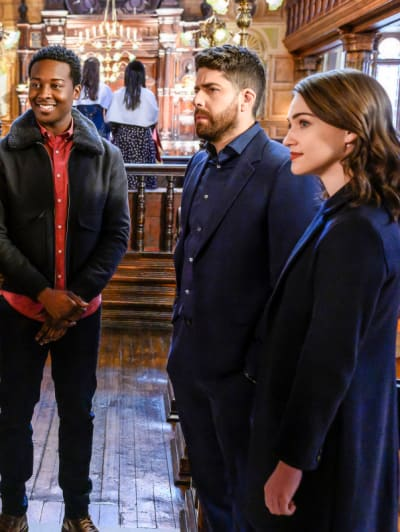 As I mentioned, I got to chat with show creators Steven and Bryan following the episode to pick their brains about that cliffhanger, what's to come in God Friended Me Season Two and if Miles and Cara can make this long-distance thing work! 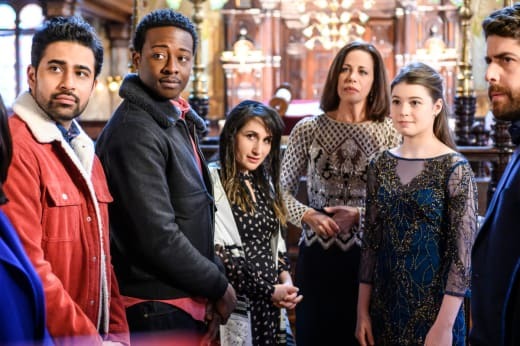 We cannot wait to dive into God Friended Me Season 2 this fall. 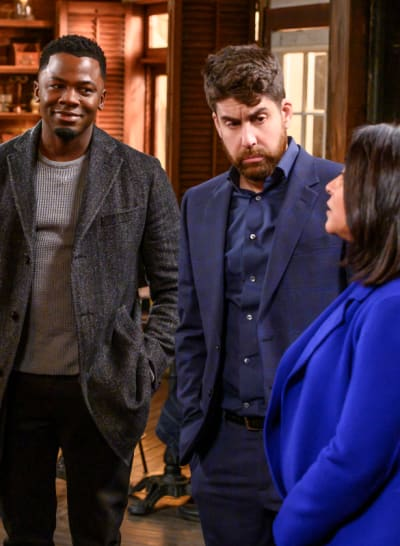 You can watch God Friended Me online to catch up on all of its magic right here at TV Fanatic! What a finale! I don’t think I’m the only one that was convinced Henry Chase was behind the God Account, but now that we know he isn’t, are we done with his storyline? Yeah. I don't think necessarily we're done with their storyline. I think Henry and Simon and Pria are definitely a part of this world, and they've made an impact on our own characters. And the fun thing is, with Cara going off to Paris at the end of this season, we'll be able to check in with her next season and see how things are going with Simon, Henry, and Pria and sort of follow that story and their trajectory as they try to you know set out to change the world as they always hoped to. So there won't be a time jump? We're still talking about that. We don't want to give anything away for season two. So let's just leave it at that. We're going to pick up pretty close to where we left off. But we still don't know who is behind the God Account. Are we going to find that out in season two or at least explore it a little bit more? Absolutely. We are 100 percent going to continue to explore because like the questions of faith itself and the eternal question of 'Is there a God' or 'is there not a God’ and 'who is God’ remains. So it’s the same with our show. But Miles did come to the realization that he actually didn't want to find out who was behind the God Account because the purpose of it was always to just help and spread hope. Does that change for him going into season? 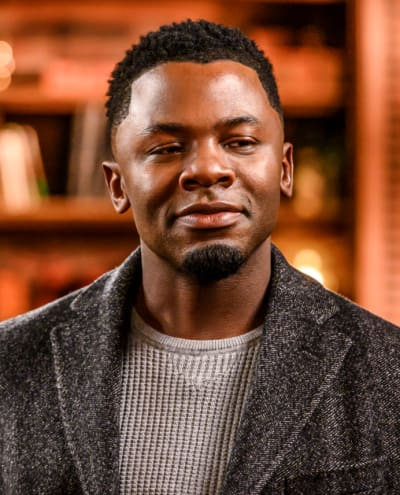 I think, obviously he had made that decision before the end of the finale, and now as you know, someone else has been sent a friend request from God and they sent Miles’ name to the character who we call Joy. It sort of has re-framed the whole mystery in a new way. And so what was once Miles's feeling of not wanting to know, has been reinvigorated in a different way not just for himself but also for Joy, this new character who is also going to be going through a similar journey that he went through. Who is behind the God Account is now even more of an interesting mystery because of the new piece of information that comes at the end of the finale. So Miles became the Friend Suggestion because he knew so much about the God Account or is Joy essentially taking the responsibility from him? Well, that's the that's the great question coming out of the season: has she been sent Miles's name because he in fact needs help or has she been sent his name because Miles needs to show her how to do what he's been doing? I think that's the question that Miles is going to be looking to figure out when we pick back up in season two. Do you think Miles’ involvement in the God Account is going to change or his role within the God Account now that Joy is involved? Yeah I think the good thing about what introducing Joy does for our world is it expands our storytelling and what Miles involvement is. And, of course, you know, on a character level, now that you have this other person who has been sort of the second person friended by God there is a relationship that is going to form in terms of a person understanding the burden and the responsibility of what they're being asked and really, only Miles up to this point has truly understood that. Can we expect more people like Joy? It's hard to say. I mean right now we're trying to iris down on why Joy, why has she been sort of chosen by the God Account and what is her role. And I think it's sort of one step at a time. So Miles and Cara finally got together. And now they're being pulled in different directions. How will Paris affect their relationship. You know it's a great question. That's something we've been talking about. I think it's like any long distance relationship, it's simply going to challenge them. But the challenge to us is, you know, Cara's a central part of our world and our story, so she will continue to be a part of the episodes. And our goal is to explore what their distance will do to them and how it will change the mystery of the God Account as well because you know the God account doesn't do anything by mistake. And Cara ending up with Simon Hayes and Henry in Paris is essentially a design of the God Account, so why is she there and how will that affect this relationship is all under the umbrella of the God Account’s plan. So as that is unfolded it will obviously challenge their relationship, but it also may strengthen it. That's that's something that we're excited to explore in Season 2. I noticed there were a lot of similarities between Miles, Cara, Rakesh and Pria, Henry and Simon and Henry. Was this intentional? It was incredibly intentional. It was always designed from beginning to be that Simon, Pria and Henry were a mirror to our three characters. A cautionary tale that of what could happen if those three are ripped apart and never fulfill their their destiny. 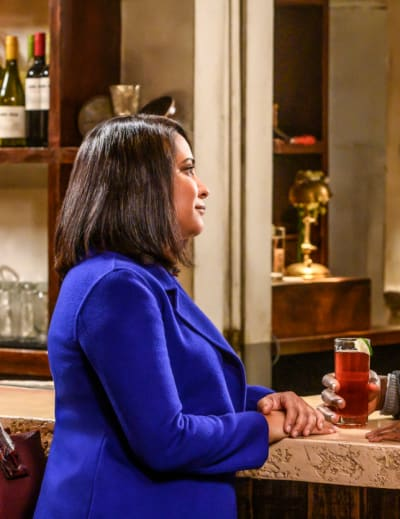 So that was closely designed and that mirror was reflected on our characters, and I think they understood that coming into the last episode when we pick back up at the beginning of God Friended Me Season 1 Episode 20 when they're at the bar and they're basically saying you know we messed up, we don't want to end up like they ended up, and we have to fix this. I mean obviously we can't reveal the answer to that, but the way we look at the God Account is that it’s a metaphor for faith and belief. And you know, with people who are believers, as their lives are unfolding and things are happening that seem impossible to explain without the sense of a greater power at work, it seems as though God knows everything about someone. I think yes it could be someone that knows Miles, but it also could be someone completely unknown that knows Miles as well as anyone, but it's chosen him for reasons which you know we continue to explore as the series goes forward. Arthur is stepping into his new chapter and planning a wedding. What will his life be like without the church? We leave the season on such a high note with Arthur. He's made this, well, two life changing decisions really, to step away from the church and then to propose to Trish, and I think he's incredibly excited about his path and that he found love again after 17 years. I think that's a great journey for him and we've got a wedding which is exciting. But I do think the challenge will be, as as the first episode starts unfold in God Friend Me Season Two, is does he miss the clock? Does he miss that calling and can he sort of live the life that he has chosen, meaning away from the church, and will that toll of wanting to continue to help people in that church still be there. You know John Lennon had a quote. He said "life is what happens when we're busy making other plans.” And you know, it's very true for Arthur that he's made this plan. So we we have a road ahead for him that we've mapped out, but you know things don't always work out the way you expect them too. It'll be an interesting road ahead for Arthur. 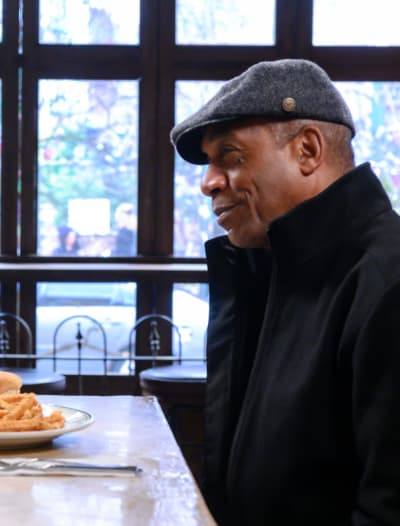 And obviously with Joe Morton, just brilliant Joe Morton playing the character, you just can't help but want to just throw a million things at him. Miles and his father made so much progress in their relationship so much so that Arthur was even a guest on his podcast which we never predicted would happen in the first episode. Why was the theme of family so essential to the series? This series is about family. I mean at the heart of it. That's what life is about. It's the most essential thing in all of our lives. I mean, where we come from to our tribe to the people we look to. Whether you're born into a family or the friends you collect are your family, that's the core essential, kind of singular element that we all share. It’s the most relatable thing and those families always been at the heart of the show. And Arthur and Miles have always been, from the very beginning, the one thing in the relationship that we've wanted to explore. And when you're talking about faith or belief or non-belief, family is right there with that.